© 2012, R.L. Delight, "The Silent Ones", oil on canvas, 18"x24"
Here is the promised finished painting, at last! The title of the painting is, The Silent Ones. The painting is as finished as it will be at this point. I honestly can't tell you what I think about it at the moment either. I know it reflects a lot of the skills I have built up so far but it also shows how far I have yet to go. The painting is going to a show in Portland called, "Bearing Witness: Healing Pregnancy Loss and Infertility Through the Arts"
On a personal note, and I will keep it short, I have lived with infertility and miscarriage for the past 27 years or so. I will also say that I have a wonderful life and have been able to do many things that would have been difficult or nearly impossible had we had children. I, along with my husband, have been mentors and Auntie and Uncle to many children throughout the years. I think this position in our culture is not valued enough. It once was. "I see them in reflections, I feel them in warm rays of the sunlight, and hear them in the sound of the sea when she whispers on a calm, cloudy evening. They have never lived on this side of the veil. Their presence brings me comfort and joy, and sometimes sadness. They are the Silent Ones." I will be spending the week getting paintings varnished, frames made, props built, and the studio cleaned before diving into the thick of things again. Drawing and sketching are ongoing as always. Oh Renee, this is so powerful. A great, evocative image clearly personal and universal at the same time. Way to go! Renee, it is beautiful, both in thought and in execution. at the exhibit and that it will find a special place in your home. Sometimes, no matter our skill, medium etc. we never feel the power of the created piece like we do the idea of it and behind it. KWIM? 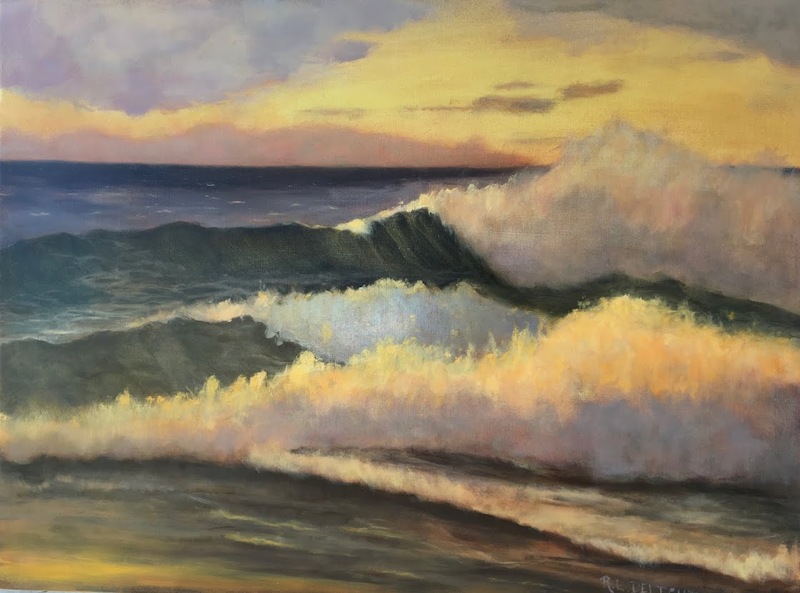 They are just too big and powerful to be contained in any once piece, but I hope you come to liking this one because it is really a lovely painting. 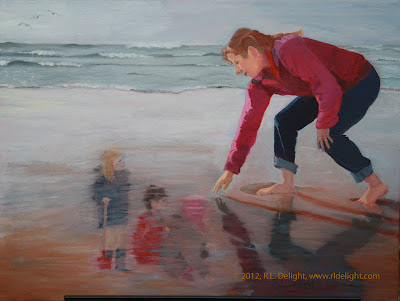 I think the children are amazing how they reflect up from the wet sand. I don't know how you did it but I want to reach out and try to touch them too! Thank you both for the lovely comments, they mean a lot to me. Well it rendered me speechless when I first saw it ( a thing almost impossible to do ) . I've been blessed with a living son but there are 2 other silent ones in my life . This is such a common experience and so rarely expressed at any level in any medium , thank you so much for painting what so many women live with .